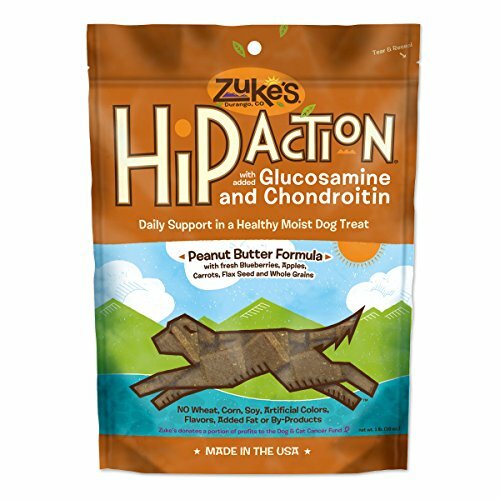 Daily Joint Support for Dogs in a Healthy Moist TreatDoes your dog have trouble climbing stairs, or is slow to get ups Does a long walk lead to limping or stiffnesss Zuke's Hip Action glucosamine treats for dogs are an easy, fun way to decrease joint stiffness and pain while helping increase mobility. 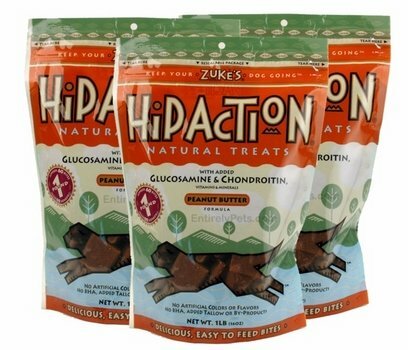 Every delicious bite contains a substantial dose of Glucosamine HCl (300mg) and Chondroitin Sulfate (250mg), plus cofactor vitamins, minerals and amino acids to aid in absorption and metabolism. 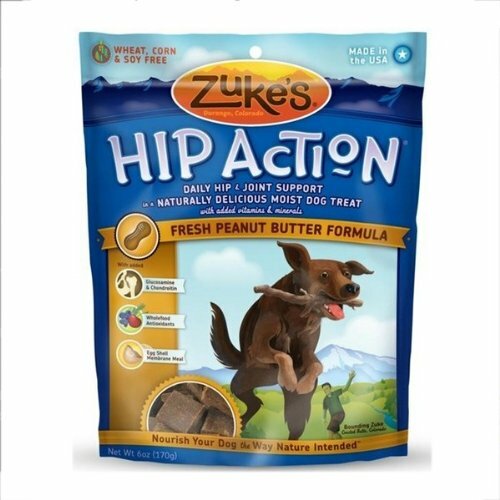 Hip Action isn't just for older dogs, help prevent hip and joint problems in your younger dog by feeding Hip Action daily.For complete joint maintenance and recovery, try Joint MAX Triple Strength. Is your dog slow to get up? Does a long walk lead to limping or stiffness? 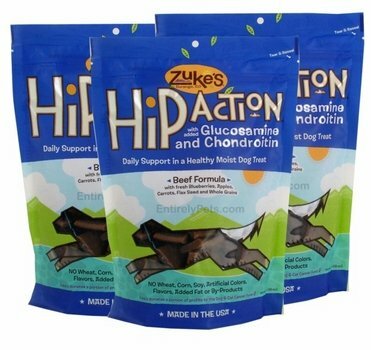 Zuke's Hip Action treats are a fun way to decrease joint pain and increase mobility. 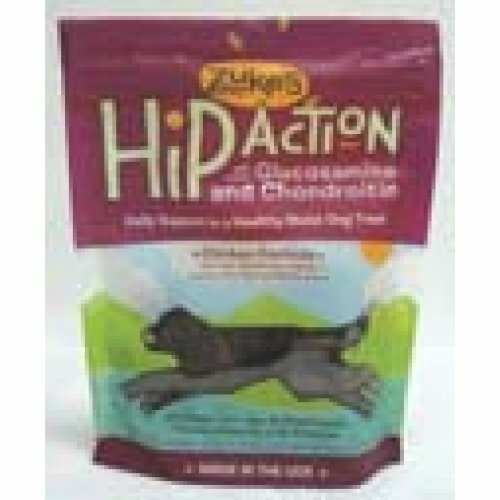 Hip Action also can help to prevent future problems in younger dogs. Every delicious bite contains 300 mg. glucosamine and 250 mg. chondroitin, plus cofactor vitamins, minerals and amino acids to aid in metabolism. 21520 Size: 1 Pound, Flavor: Chicken Features: -Easy to feed your dog, no messy pills or powders. -Contains essential cofactor vitamins and minerals that aid in absorption. -Made in the USA. Treat Type: -Biscuits and cookies. 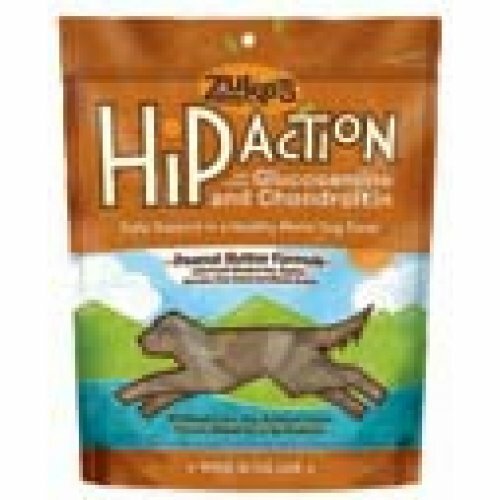 Zukes Hip Action Natural Dog Treats, 1 lb. 21522 Size: 1 Pound, Flavor: Peanut Butter Features: -Easy to feed your dog, no messy pills or powders. -Contains essential cofactor vitamins and minerals that aid in absorption. -Made in the USA. Treat Type: -Biscuits and cookies. 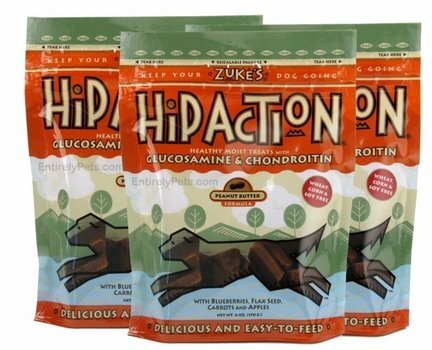 Does your dog have trouble climbing stairs, or is slow to get ups Does a long walk lead to limping or stiffnesss Zuke's Hip Action glucosamine treats for dogs are an easy, fun way to decrease joint stiffness and pain while helping increase mobility. 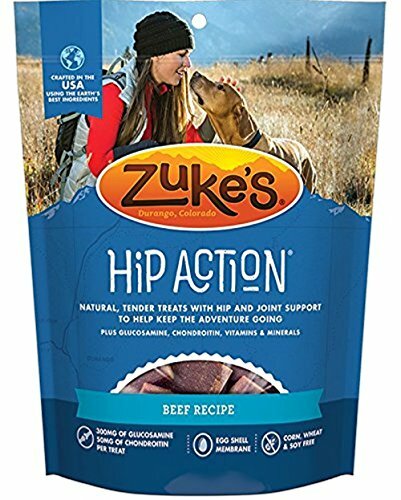 Every delicious bite contains a substantial dose of Glucosamine HCl (300mg) and Chondroitin Sulfate (250mg), plus cofactor vitamins, minerals and amino acids to aid in absorption and metabolism. 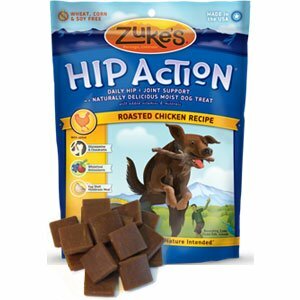 Hip Action isn't just for older dogs, help prevent hip and joint problems in your younger dog by feeding Hip Action daily. Peanut Butter6.25 OuncesDog Treats Ground Rice, Ground Oats, Peanut Butter, Malted Barley, Maple Syrup, Gelatin, Vegetable Glycerin, Glucosamine Hydrochloride, Fresh Apples, Fresh Carrots, Ground Flax Seed, Fresh Blueberries, Lecithin, Salt, Garlic Powder, Etc.Each Dog Treat Contains 300 Mg Glucosamine And 50 Mg Chondroitin.Easy To Feed Your Dog, No Messy Pills Or Powders.Contains Essential Cofactor Vitamins And Minerals That Aid In Absorption.Made In The Usa.Wheat, Corn And Soy Free.All items are brand new, never worn and never used. We guarantee the authenticity of all items. 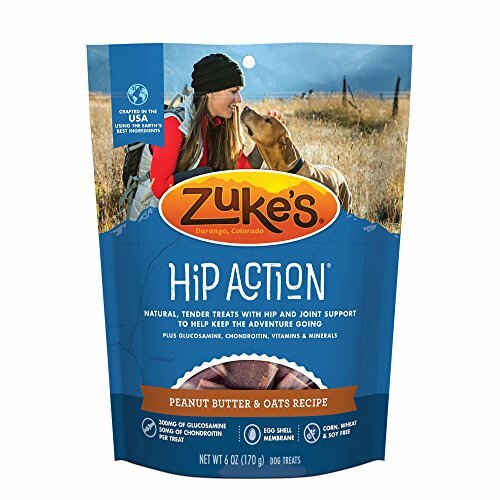 Zukes Hip Action for Dogs - Peanut Butter 6 Oz. 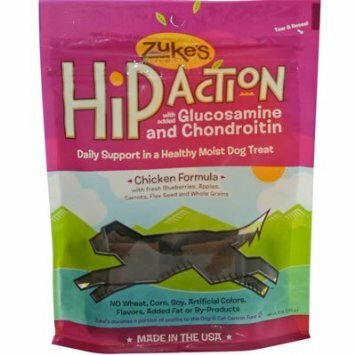 300mg of Glucosamine, 50mg of Chondroitin, and natural eggshell membrane: powerful joint support ◦Easy-to-feed: supports mobility without pills, liquids or powders ◦Co-factor vitamins and minerals: support absorption of nutrients and antioxidants ◦All-natural ingredients: safe if dogs eat large quantities - like the whole bag!